Our Infant Program places a high priority on providing a safe and nurturing "home away from home" where infants can explore and make new discoveries. Friends ELC's Infant Program is designed to be a place where your infant will have the freedom to move and explore. In addition to caring for your infant, everything we do is designed for learning and challenging them to hit their developmental milestones. By providing a safe and nurturing environment with regular teacher-child interaction, we help to foster curiosity and confidence within the child as they explore the world around them. We support your baby as they roll from side-to-side and learn to crawl, stand, and then walk. 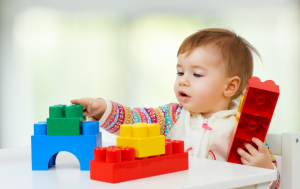 We focus on the development of motor skills with age appropriate toys while meeting your child's individual needs for rest and nutrition. We provide daily communication on your child's progress so you can be actively involved in their care. Daily schedule for the children in the Infant Program: Infant Nursery Schedule (6 weeks - 12 months).